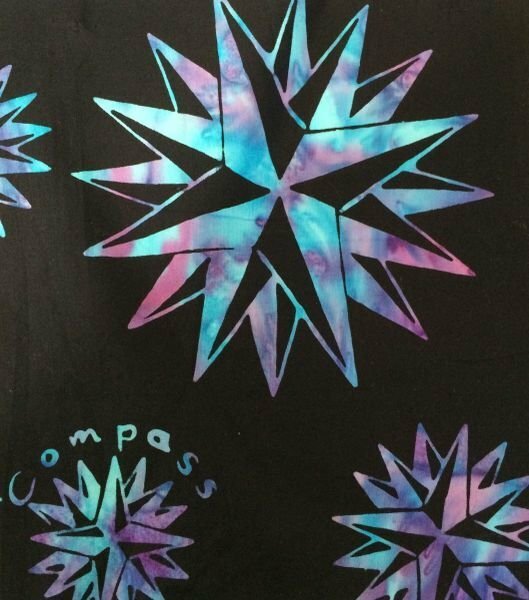 Three compass' in different sizes, one of which has our name "Compass Centre" around it like our logo. This is a beautiful batik from Hoffman Fabrics has peacock/turquoise and raspberry compass' sitting on a great black batik.For coordinating fabrics we suggest the following batiks from Hoffman: 1895 - Raven (a great black), 1895 Peacock, 1895 Raspberry. We have seen a variety of fabrics from all manufacturers that coordinate with these fabrics. Have fun! We have chosen not to feature batik yardage on our website at this time, as our guests see to it that our stock turns over at a very fast rate. However, if you are looking for a particular batik, please email or give us a call as we have a very large number of these in stock and can usually get additional yardage in a timely manner.